Ready for some mayhem on your stag do in Barcelona!? 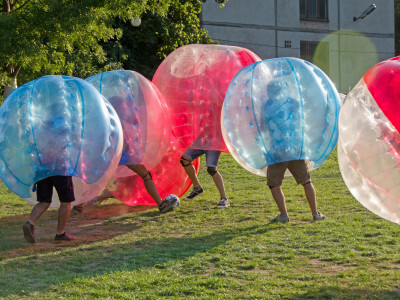 Easy – all you need is your mates, a football… and inflatable bubbles around each of you! You might have seen this before, and yes… It is as fun as it looks! Studies have shown that there is in fact a joke that never gets old, and it’s seeing two guys try to compete for the same ball and go bouncing away from one another! Of course, you’ll have a bubble football referee who knows all the rules! Not only is this guaranteed to be insanely funny, it’s a great equaliser… That one mate you have that plays like Messi? Enjoy being just as good as him for the hour you play! You have everything that you need included in the price, as well as an instructor/referee, sporting equipment and insurance. Location: Barcelona City, you can reach easily by Metro or Bus!